Our honeybees swarmed. That is to say, they left. We knew what we were getting into when we became beekeepers—we have read all about Colony Collapse Disorder, and we have heard our beekeeping mentor talk about how he continues to lose half of his hives each year. But none of that prevented our chests from tightening the way they did when we walked up to a silent hive early last week. It didn't change the feeling of sorrow we felt upon realizing what had happened. It didn't silence the persistent thoughts that we had failed as beekeepers in our mission to help save the bees. Needless to say, our catchphrase "I can't wait to not be a first-year beekeeper" still rings true. As it turns out, honey helps. It helps a lot. We had initially feared losing our bees after a long, cold Ohio winter—at which point, they could have already consumed most or all of the honey that they had stored from the previous season. However, since they chose to swarm during this unusually warm month of November, they left us with a bounty of liquid gold. How very bittersweet. Harvesting raw honey is a very slow, very sticky process—like most things beekeeping. Our friends at The Wholesome Hive were kind enough to let me occupy their home for an entire morning & afternoon, uncapping honey comb & extracting honey using their hand-cranked centrifuge. After much straining & draining, I returned home with a very heavy bucketful of honey. After spending a small fortune on mason jars, the final, unexpected & bittersweet harvest of our first season as beekeepers is complete. We haven't finished weighing our product, but we estimate there is somewhere between 40 - 50 lbs of honey sitting on our kitchen table waiting to be gifted, bartered, and consumed. Thank you, honeybees, for your generosity. Though our hearts are broken, our coffers are full. And we know that we will be better beekeepers next year. In the words of Jack Kerouac: "Praised be honey at the source." KEEP IT HONEST: PART ONE | I CAN'T WAIT UNTIL . . .
You won't have to listen for very long before you hear Mark or I say, "I can't wait to not be a first-year beekeeper." It is my sneaking suspicion that anytime we jump headstrong into something, usually without knowing exactly what we're doing, those kinds of sentiments are par for the course. There are unforeseen challenges, in which you are confronted with situations you did not even know existed; there are those moments, equal parts terrifying and humbling, whereby you consider the possibility that all of your efforts are for naught. But it would be insufficient if I did not mention the glorious feeling of hard earned accomplishment that comes with new endeavors. There is nothing quite like it. It might seem that the honey harvest would be the crux of accomplishment for a beekeeper. Or for those who are a little more familiar with the world of apis mellifera, it might be assumed that catching your first swarm, or even having a colony healthy enough to swarm, would be pinnacle moments. For us, and I suspect for many ecocentric beekeepers, accomplishment has always been about the health and comfort of the bees. Our relationship with the honeybees is important, and it is one that is constantly in flux. 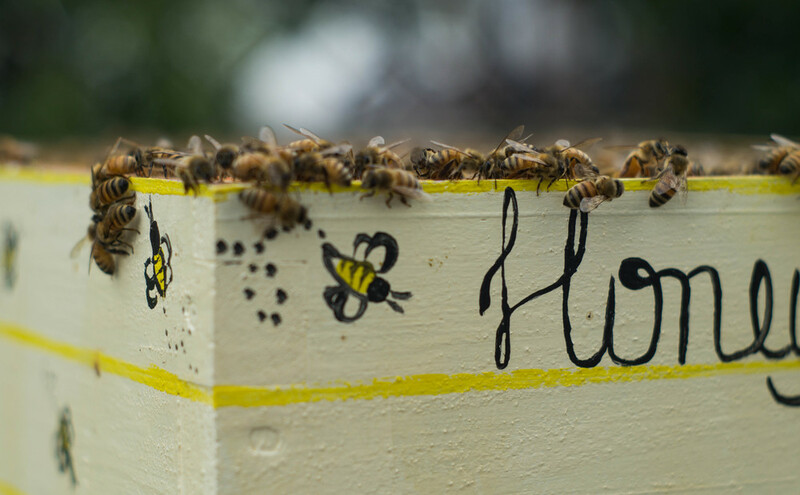 Hive inspections are predicated on the understanding that if the bees are too disrupted (for any number of reasons), or if we make a mistake and throw off the harmony of their colony, we will step away. We will go home, because let us not forget that the very hive we are sticking our clumsy fingers into is a honeybee's one and only home. They have fanned, chewed, regurgitated, and died to build their home. Who are we to exert dominion over that ecosystem? To avoid these foes, the beekeeper influences the conditions under which a colony exists. Structure is important if you hope to have any real chance at a symbiotic honeybee / beekeeper relationship. Frames (the wooden structures that honeycomb is built into) make a world of difference. We know that because we left five inches of our top super (the box that frames rest in) frameless. On accident. We always meant to get around to installing the final two frames, but one week turned to three, and when we returned . . . This happened. With open space, but no frames, the bees set to building freeform comb, which they secured to the hive lid. In case you are not quite following, it means that as soon as we opened the lid, we ripped apart the top of new, highly delicate honeycomb, rendering their honey exposed and their hive mentality something to the effect of Very Mad. I will spare the unfortunate details of all that followed. It was upsetting, very sticky, and not our best moment as a couple. We did what we could, and then we left: dejected, swollen from beestings, and wholeheartedly disappointed in our own negligence. But we went back two days later and gently harvested a bit of honey. Because that's what you do when you are passionate about your endeavor. You read up on it, you return to your project, and you remember that there will come a time when you are not a first-year beekeeper.